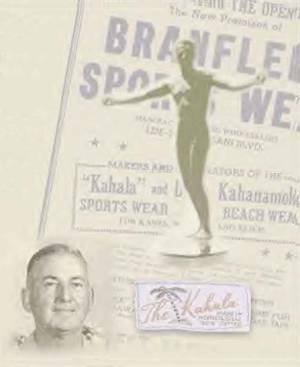 Back in 1936, another innovator in the development of the Aloha Shirt was George Brangier (at left) whose company, Branfleet, later became Kahala Sportswear. First developed in the early ‘30s as a "tourist attraction," Aloha shirts have their roots in the graphic, comfortable clothing that South Seas islanders have been wearing for hundreds of years. Around 1935, a small-but-daring group of clothing manufacturers, including George Brangier of Honolulu, hit on the same idea near simultaneously. To make wildly colorful, "air-conditioned" short-sleeved shirts for tourists that would give them an immediate sense of relaxation, and going "Hawaiian." The shirts were also, as one clever Waikiki marketer observed, "Postcards you can wear." Branfleet and Kahala were born. Aloha Shirts from Kahala trace their splashy history of Hawaiian shirts from their beginnings right after the Great Depression through their popularity with World War II American servicemen and into the "Golden Era" of Hawaiian tourism and garment manufacturing—from 1935 to 1955. The aloha shirt has come a long way over the years. What was once a colorful tourist memento has evolved into a prized art form combining fashion, style and an unabashed love for all things Hawaiian. So it has been for more than sixty years, with countless Hawaiian print shirts designed and sold for the pleasure of millions of people. Kahala has always been at the forefront of the Aloha Shirt industry. Kahala in the year 2009 is run by Dale Hope, who was born in Honolulu and has spent his life in and around Hawaii's garment industry. He inherited his parents clothing business when he was in his twenties. He is currently the General Manager and Creative Director for Kahala Sportswear. Widely recognized as an authority on Aloha shirts, he received the first Governor's Cup for "Hawaii Apparel Manufacturer of the Year" in 1987. He is also author of the "Aloha Shirt Book" which is the most influential authority on the subject. One thing hasn’t changed about aloha shirts: They still make fabulous mementos of a Hawaiian vacation and tangible reminders of Hawaii’s famous aloha spirit.